As the Brexit debate in Parliament reaches crescendo, much of the public has been left cold. MPs have been so absorbed in backstops and withdrawal agreements that nobody is addressing the underlying problems that led many people to vote for Brexit in the first place. Far too many people are living in communities with proud histories that have nevertheless been battered by deindustrialisation and decades of neglect. The economic potential of these areas isn’t being realised, and many talented people feel hopeless and trapped. Under-investment, public services starved of funds, an NHS under unprecedented strain, and our failure to integrate migrants better were not the only reasons people voted to leave the EU – and public spending isn’t the only answer. But these problems are crying out for attention whatever happens on Brexit and, without money, it will be harder to solve them. We will be better able to heal our divided country if we don’t quit the EU – not least because our politicians will have time to focus on something other than Brexit and our government will have more money. Contrary to the big lie during the referendum, we will have more money to spend if we stay in the EU. It seems fair to say this will be billions and probably tens of billions of pounds a year. This dividend should be invested to bring our country together. The blow to the public finances that would be caused by any kind of Brexit would dwarf any savings from lower financial contributions to the EU. Indeed, the Prime Minister’s deal will in the long run have a negative fiscal impact of 1.8% of GDP once the hit to productivity is taken into account, according to an analysis by the ​Institute for Fiscal Studies​. If we quit with no deal at all, the negative fiscal impact would be even greater. 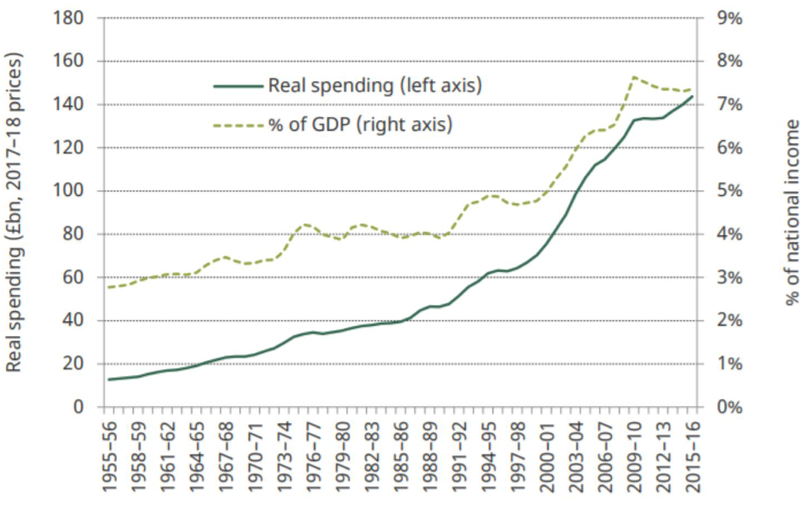 1.8% of ​today’s GDP​ is £36 billion. This is a rough measure of how big the dividend would be. ​A Jumpstart Fund for parts of the country that have been starved of investment. ​A cash infusion for the NHS, above and beyond what the Prime Minister has promised. ​A Migration and Communities Fund for areas which have been challenged by sudden or significant population changes. For far too long, parts of the country – the so-called “left behind” – have been neglected by Whitehall and Westminster. Money has gone into London and some other big cities. By contrast, many of our towns have been blighted by de-industrialisation and have not enjoyed similar investment. They have rich heritages, but they have been denied the public investment needed to regenerate themselves. The quality of the housing stock is often low. There hasn’t been enough investment in skills or opportunities. As a result, these communities have failed to attract much private investment and those who do have skills have often left for London and the big cities. This has led to a seriously imbalanced country. Those who are left behind struggle to find meaningful jobs in their communities. Large swathes of the country are stuck with low investment, low productivity and low pay. This is stopping the whole country performing anywhere near its potential. We have to reverse this cycle of decline. Part of the answer should be for towns to take back control from Whitehall. They need more power to both raise money and decide how to spend it. But there also needs to be more investment in the poorest communities. A large chunk of the dividend should therefore be channeled to the poorest parts of the country via a new Jumpstart Fund. This money should be in addition to the ​£2.2 billion​ a year that economically deprived communities receive from the EU’s structural and investment funds. The money would be given to local authorities. It could be used for a wide variety of purposes: to improve skills, public infrastructure, the quality of housing, and local transport links as well as to encourage business development. Local people would decide exactly how the money was spent. This would show that people can take control of their lives while staying in the EU. There is also a strong case for a one-off catch-up payment of billions of pounds to make up for the many years when Westminster and Whitehall have neglected these communities – and to show that the country is treating these problems seriously. Many people voted to leave the EU because they believed the slogans on Boris Johnson’s bus. Although the NHS’s budget has gone up during the years of austerity, it has not risen fast enough to keep pace with the needs of our ageing population. Nor has it risen as fast as it did before the years of austerity. As a result, all areas of healthcare provision, including accident and emergency, acute hospitals, general practice, mental health and community services are struggling. A squeeze on pay has damaged morale and led to staffing shortages. Brexit is making this worse. Nurses and doctors from the rest of Europe are leaving because they don’t feel welcome. And far fewer new medical professionals are coming to our country. The government announced in June that it would increase funding for the NHS in England by 3.4% a year in real terms until 2022/2023 – leading to a total increase of £20 billion in the final year. This is welcome, but we must go further. The government’s plan will, at best, allow the NHS to keep up its current level of performance. 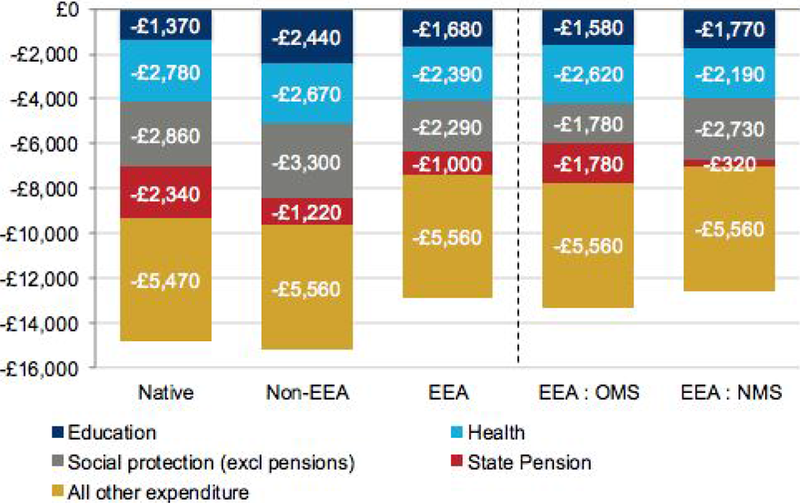 To repair the damage, a further large chunk from the dividend should invested in the health service – and a significant proportion of the extra funds should be directed towards communities with relatively poor health and life expectancy. Free movement from Europe enriches our communities in many ways. European citizens contribute to our culture – and many have become our friends and family. They also boost our public finances, because they pay more in taxes than they consume in public services. Migrants from the EEA made a positive contribution of £4.7 billion in 2016/2017, according to ​research​ for the government’s Migration Advisory Committee. This is because most EEA citizens are young and well-educated, and tend not to need so much healthcare or receive as much in pensions. 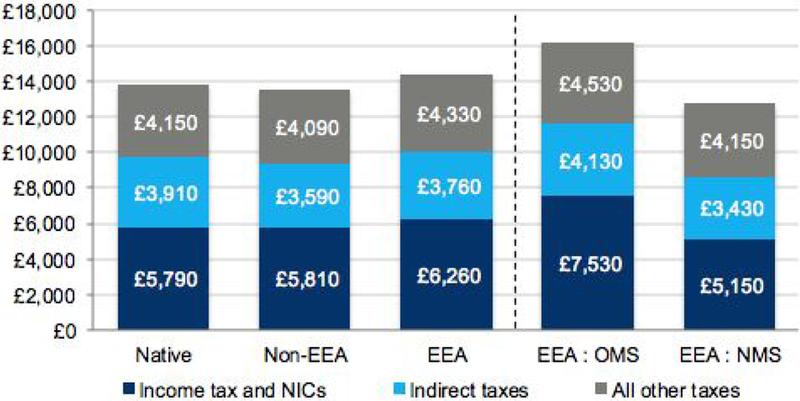 As a result, they pay more in taxes and consume less in public services than UK nationals. The problem is that the money they bring to the public purse doesn’t end up where it is needed. So we propose that a large proportion of the annual contribution of EEA migrants is put into a new “Migration and Communities Fund”. The money would be channeled to those parts of the country which have experienced sudden or significant population changes – showing that free movement has tangible benefits for local communities and making a real difference to people’s quality of life. The money would go not just to areas where EEA citizens have arrived; but also to areas which have seen large migration from outside Europe (which is now nearly ​three and a half ​times greater on a net basis than that from inside Europe). The annual Migration and Communities Fund would be ring-fenced within the public finances. The Treasury would not be able to raid it for other purposes. If just half of the money EEA citizens contribute to the public purse was earmarked in this way, it would amount to £2.4 billion a year. The money would be given to local authorities. It could be used for a wide variety of purposes: to relieve pressure on GP surgeries, so the ratio of doctors to patients is at the national average; to boost the number of teachers in schools; to invest in local infrastructure; for sports or youth centres; and for programmes to help migrants who, for example, want to learn English. Local people would decide exactly how the money was spent, letting them have some measure of control in their communities. The UK used to have a small Migrant Impact Fund. But it was scrapped in 2010. Communities have been starved of investment for eight years. There is therefore a strong case for a one-off multi billion pound injection into the new Migration and Communities Fund to cover the eight-year gap. We have a duty to address our country’s deep-seated problems. But Brexit is not the answer. It would make them worse. Staying in the EU will not automatically make things better. But our economy will be stronger and our public finances will be healthier. That will give us the resources to tackle our problems if we have the political will to do so.